This product includes software developed by the uvnc bvba. The server is a Windows 7 x64 box going [eventually] to Florida. The client is a Windows XP x86 that will be located in NYC. Installation of the server started okay, then the client was installed and a connection was made between the two PCs. While both PCs were in the same room, they were actually using different routers for Internet access. I opened a Microsoft Access app on the server PC via the client PC and my initial test was over. Now comes the rub: the installer didn't actually finish. As I now recall, the server displayed the setup dialog (ie. group name, access server IP, password), then launched the server, instead of [maybe] just rebooting the PC. Anyway, I installed the client, made the connection, opened a program, then logged off. I then closed the installer manually, rebooted the server PC, and that's where the fun begins. Turns out that the server wasn't installed properly and for the next two hours, I couldn't get the server going again. Every attempt to reinstall it failed at the very end with a message: "A program failed to start....". Deleted registry entries, checked the TEMP directory, discovered a series of log files showing that the server itself wasn't starting (ie. "pchelpwarev2.exe -install".) That last bit was from my own memory, so it might not be totally accurate, but essentially correct. Finally, I got it [the server] to launch by tweaking the server installer's compatibility mode down to XP SP2. This time once the server was running, I exited the server cleanly and the installer exited cleanly. I was able to reboot and login from my new client several times. My final observation is that I could never completely operate the server PC, that is the client's keyboard input was ignored. On the server side, the mouse pointer couldn't be controlled, but keyboard input was possible. So, if I operate the mouse and my customer follows my instructions and does the keyboard strokes on his end, all will be well. I wish I'd sent this message while all of the details were completely fresh, but.... If there's a way to completely purge all server settings/traces and try this again, I'd love to do so, in order to see if I can get better results than reported above. For the record, I've been using UVNC for several years, although I realize PCHW is a completely different codebase. 1. 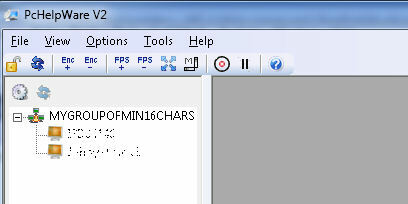 When I create sfx without setting AccessCode and Password, sfx is created without name: .exe. Starting this executable, the Acces Code field is empty but isn't editable. 2. When I create sfx setting AccessCode, ex: test, sfx is created with name test.exe. Starting this exe the Acces Code field contains test but also isn't editable. How can I create sfx with Acces Code editable?